On a warm, windy August day in 1981, a crowd gathered at the fairgrounds in Santa Rosa for the final event of the soybean fair that’s held every other year in the small city in southern Brazil. Schools had let out so local students could attend, along with curious fairgoers and a collection of bigwigs whose rank rose all the way up to João Figueiredo, then the president of Brazil. Speeches were made, the national anthem played, and then, around 1 p.m., a small tree was planted to symbolize a new ecological consciousness that was stirring in the heart of Brazilian farm country. “The moment the tree was planted, all the city’s church bells started ringing,” recalls Nilso Guidolin, president of the 1981 soybean fair. “It was a joyful moment.” And it was a very special tree: a Sequoia sempervirens, or California redwood, grown from a seed that had traveled to the moon. After being planted with much fanfare, this symbolic tree was forgotten, neglected and abused over the following years. It almost died. It needed a hero. Little more than a decade earlier, the Apollo 14 mission blasted off from the Kennedy Space Center in Florida. On board were Alan Shepherd, Ed Mitchell and Stuart Roosa, the command module pilot who would remain in lunar orbit while the others descended to the surface. Inside his Personal Preference Kit – a little bag that NASA allotted each astronaut for personal effects – Roosa had stashed a few keepsakes, including his wife’s wedding ring, a small American flag and a custom-built, fist-sized container filled with hundreds of tree seeds. Long before he’d become an astronaut, Roosa spent a summer as a smoke jumper out West. As he prepared for his trip to the moon, he reconnected with the U.S. Forest Service and helped arrange a simple science experiment: How would a voyage into space affect tree seed germination upon return to earth? The Forest Service provided seeds from five common species: loblolly pine, sycamore, Douglas fir, sweetgum and redwood. Roosa let them hitch a ride in the rocket. The Apollo 14 mission followed the script. While Shepherd and Mitchell visited the moon, Roosa and his seeds orbited it 33 times. Nine days after liftoff, all of them returned to Earth safely after splashing down the South Pacific. After three weeks in quarantine, Roosa emerged to a whirlwind of post-mission publicity tours and debriefing and returned to training as a backup crewmember for subsequent Apollo missions. Somewhere along the way, Roosa – who died in 1994 – handed the seeds back to the Forest Service, remembers his daughter Rosemary Roosa, who was seven when her father flew to the moon and now runs the Moon Tree Foundation. Eventually, the Forest Service germinated the seeds and grew them beside control seeds. “Anecdotally, in talking to folks over the years … there was no difference [between them],” says Dana Nelson, a Forest Service research geneticist based at the Southern Institute of Forest Genetics in Saucier, Mississippi, where many of the seedlings were grown and seven loblolly pines from the moon mission still stand. “It was a bit of a publicity thing from the higher-ups in the forest service,” Nelson says. Formal study of the spacefaring seeds didn’t go beyond this science fair-esque level, and the Forest Service research group in Mississippi wasn’t formally involved. Nor did NASA ever do anything official with the seeds, adds Roosa, which were simply packed along with with her father’s personal mementos. The historical record gets spotty at this point. One way or another, some of the seeds – including the redwoods – ended up at a Forest Service research facility in Placerville, California, and the rest were kept in Mississippi. A few years later, nearly all of them were given away to be planted all over the United States as part of the country’s bicentennial celebrations. The Forest Service had hung onto at least a few of the moon seedlings, and in 1980, gave at least two of them to the Brazilian government. Deputy Forest Service Chief Thomas Nelson attended the planting of a moon sweetgum that year at the headquarters of Brazil’s national forestry agency, where, in his remarks, he said he hoped both the tree – which is still alive in Brasilia – and joint US-Brazilian forestry research would flourish. But there was one more seedling in Brazil. The day Brazil’s moon redwood was planted at the soybean fair, a young Santa Rosan named Vilso Cembranel was away studying agriculture in Porto Alegre, the state capital. By the time he returned home and started working as an agriculture teacher, the moon tree had receded from public consciousness. Cembranel recalls first seeing it some years after it had been planted. It was six or seven feet tall, and seemed to be doing alright. But as the years passed, the tree’s fortunes waned. 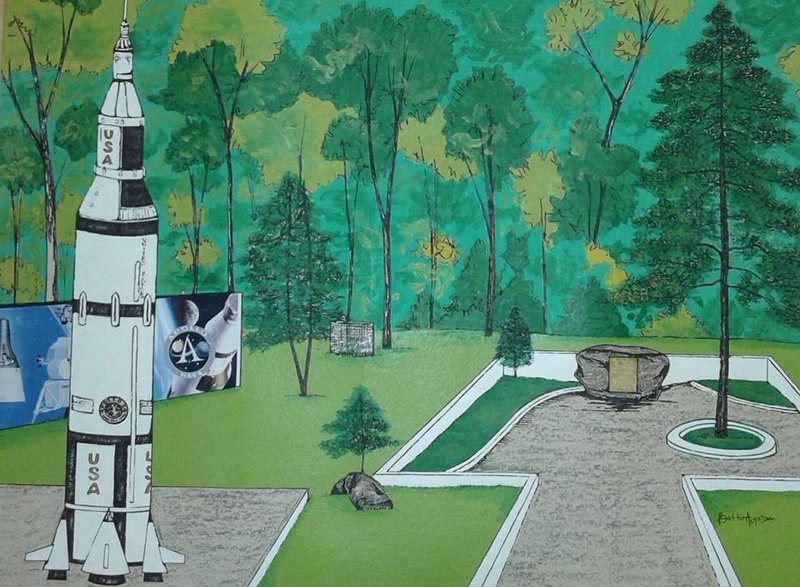 The city had poured an ill-conceived concrete pad in the shape of the Apollo 14 capsule around the tree, which complemented its backstory but also prevented a significant amount of water from reaching its roots. Drought in the region struck from time to time, further stressing the already parched tree. The tree’s visitors would read the plaque describing its history, and promptly strip away bits and pieces of bark as souvenirs. Bigger trees in an adjacent patch of forest grew tall and blocked out much of the sky—the moon tree’s outlook turned bleak. In 2006, the city’s tourism secretary got in touch with Cembranel, who by then had retired from teaching and gone into business as a landscaper. She asked if he’d be willing to help spruce up the area around the moon tree as part of a push to highlight the city’s attractions. Even though he lived close by, it had been years since Cembranel had seen the tree. Expecting to find a large, healthy redwood at the fairgrounds, he was shocked to find it stunted and ugly—it was nearly dead. Cembranel’s mission shifted installing attractive landscaping to simply saving the moon tree’s life. The first priority was getting rid of that Apollo 14-shaped concrete patio. 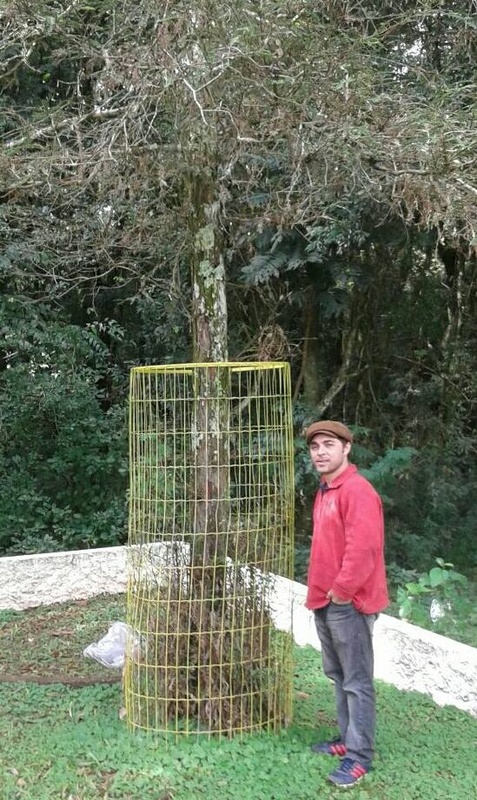 At Cembranel’s request, the city removed it and installed a spigot so he could water the tree. But Cembranel recognized another threat to the struggling tree’s health: a bright streetlight that illuminated it all night long. “It never got to rest. It was a really stressed tree,” he says. He asked the city to take down the lamppost, but this time they didn’t listen. Cembranel had to go rogue. When he’d go water and tend to the tree, he’d take along a slingshot and use it to knock the streetlight out of action. When the city repaired it, he’d shoot it out again, and again, and yet again. When they put a screen beneath the bulb to protect it from larger rocks, Cembranel threw fistfuls of gravel that doomed the poorly placed light. In total, he figures he broke that same lamp eight to 10 times during a campaign of eco-sabotage that lasted more than a year. Then, one day, he crossed paths with a work crew fixing the light. The work crew did not replace the light, and shortly thereafter took down the entire post. Workers even came out and pruned back some of the bigger trees that were shading out the moon tree. Through force and diplomacy, Cembranel had prevailed. In no time, the sick, sad little redwood responded. When he rediscovered the dying tree, it wasn’t even 10 feet tall. Now, 11 years later, it’s nearly tripled its height. Thanks to his efforts, Cembranel is now confident that Santa Rosa’s moon tree will survive. But he doubts that it will ever truly adapt or thrive. It suffered too long, it’s still crowded by other, much larger trees, and it is, simply, too far out of its element – strange soil, strange plants, strange climate – to ever fully achieve its full, towering redwood potential. Since rescuing the tree, Cembranel has also been doing everything he can to keep its legacy alive by growing new seedlings from it. It’s been a painstaking process, with many of his early attempts to direct-root young shoots from the original tree ending in failure. But after several years of frustration, he had a breakthrough when some shoots took root in soil scraped from the base of the mother tree. One of them is now planted a few dozen feet away – though it, too, is a scraggly and stunted thing. Cembranel used those first clones to cultivate a second generation, and then another and another and some more yet, each generation a little healthier and more vigorous than the last. He started planting some of them around town; a nice redwood is now growing at the vocational school where he once taught; there’s another at a nearby elementary school. Though planted less than a decade ago, and close to 30 years after the original moon tree, both of these are already as big as the original. In 2013, Guidolin (the former soybean fair president, who also has one of Cembranel’s cloned redwoods growing in his front yard) was in charge of a biennial furniture exposition that’s another major event in Santa Rosa. He picked the moon tree as that year’s theme, and had Cembranel grow redwood seedlings to give out to attendees. Cembranel brought around 300, which went like hotcakes. In total, Cembranel figures at least 500 redwoods descended from the original Santa Rosa moon tree have been planted all over this part of South America, including several neighboring Brazilian states along with Argentina, Uruguay and Paraguay. He figures half of them are probably still alive, though distribution has been haphazard and he hasn’t kept track of where they’ve all ended up. And so, after decades of neglect and a very near brush with death, the moon tree has come roaring back to prominence in Santa Rosa. 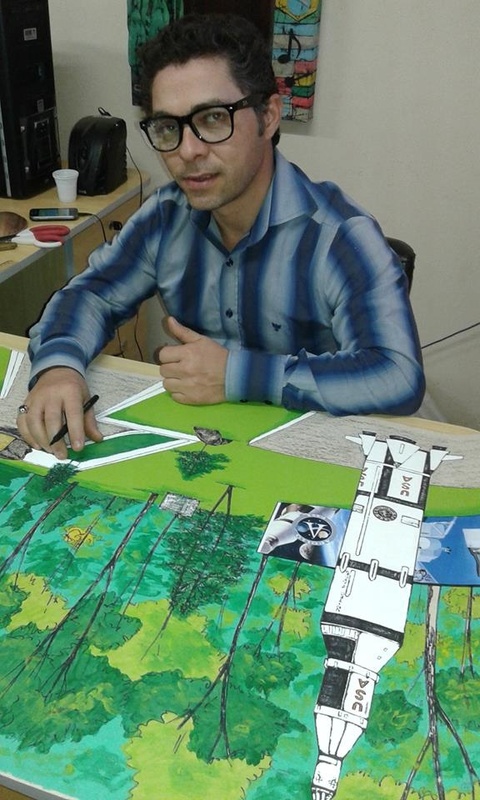 A local artist named Betto Almeida is now overseeing construction of a 50-foot-tall replica of the Apollo 14 rocket that they plan to place beside the original redwood at the fairgrounds during the 2018 soybean fair. Once that happens, Cembranel is going to plant more of his latter-generation seedlings to create a grove at the spot. Separate plans are in the works to put in a second redwood grove in another city park along an old railroad bed. On a warm spring morning, Cembranel stands beside the curious redwood he saved through a combination of love, persistence and slingshot sabotage. Toucans screech in the woodlot nearby. “Nothing is impossible,” he says, reflecting on what he’s learned from one bedraggled tree that’s come to stand for so many different things: the possibility of spaceflight, the dogged will to survive, the serendipity of chance, the inspirational power of symbol. EPA Lifetime Drinking Water Health Advisory is 15 µg/L, (parts-per-billion) perchlorate. Martian perchlorate eutectics will run about 30 wt-%. Close enough?